Right now, when I say, "Alexa, mow the lawn," my Amazon smart speaker says, "I added 'mow the lawn' to your shopping list." So there are some things technology can't do...yet. But if you happen to have a new Wi-Fi enabled Roomba vacuum cleaner by iRobot (NASDAQ: IRBT), as well as an Amazon Echo -- and you've set it all up properly -- you can say, "Alexa, ask Roomba to start cleaning," and check vacuuming off your list of chores. And with an iRobot robotic lawn mower on the horizon, Alexa just might be able to mow my lawn soon. This all sounds amazing, but it may not be enough to earn iRobot a spot in your portfolio. Let's dig a little bit deeper to see if the robotic vacuum pioneer is a worthwhile investment. 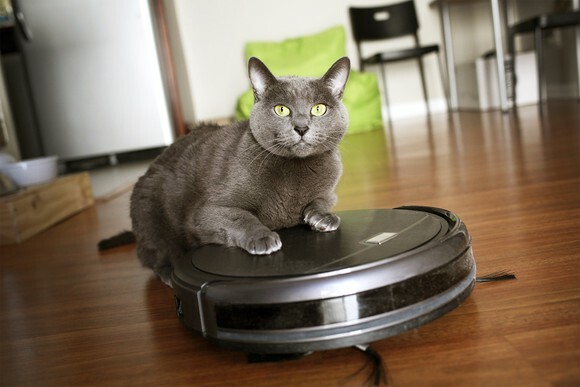 Besides being a great cat toy, iRobot's best-selling robotic vacuums can integrate into smart-home systems. Image source: Getty Images. iRobot is a small company that's making a big impact, but its balance sheet doesn't look like that of many tech start-ups. For one thing, there's no long-term debt. None. Since 2015, the company has been able to finance its growth and its extensive research and development efforts almost exclusively from its profits, while reducing its overall share count by 6%. The company's income statement also doesn't look like most manufacturers', considering its gross profit margin on a trailing-12-month basis is 50.5%. That's incredibly high for a manufacturer. Manufacturing companies often see profits eaten up by production costs. Whirlpool's gross margin, for example, is just 17%, while Hoover and Dirt Devil parent company Techtronic's is 37%. While many consumer appliance makers have struggled over the past year -- Whirlpool's stock, for example, is down 28.2% -- iRobot's is down only 4.3%, outperforming the S&P 500. That's thanks to some stellar performance that's led revenue and net income to move steadily higher throughout the year. The longer-term picture is even brighter: Over the past five years, iRobot has increased revenue and net income by 108.9% and 174.5%, respectively. But the company's biggest opportunities may lie ahead. We're not quite living in an episode of The Jetsons, but there's no denying that the market for smart-home devices is not only growing quickly, but seeing rapid technological advances. According to eMarketer, domestic smart speaker usage is set to increase 15% year over year in 2019, partially as a result of their popularity as a Christmas gift item. That means about 74.2 million people -- roughly 27% of the U.S. population -- will have a smart speaker in their home. That's a lot, considering these devices didn't even exist a few years ago. But it's still a small enough number that there's plenty of room for the market to grow. In fact, research firm Strategy Analytics predicts that 1.94 billion smart-home devices will be sold in 2023, outpacing demand for smartphones. The Market Research Store estimates a total smart-home market of $163 billion by 2026. Of course, people with smart-home speakers aren't just going to use them to play music. They'll want to use them to vacuum and mop the floors, clean the pool, and mow the lawn. iRobot already offers robots that can do three of those four chores. As for the lawn mower, on the most recent earnings call, CEO Colin Angle would only say, "We remain committed to launching a lawnmower and I'll stop there. It's a...well, I'll stop there." iRobot has been developing (and patenting) the room-mapping technology that will allow its devices to more effectively accomplish their tasks. For example, the newest v7 Roomba can distinguish rooms from one another, allowing you to command it to clean a specific room. But this technology can be used in other ways. In fact, Angle says he's working with Alphabet's Google to develop "new, innovative smart-home experiences that leverage a broader understanding of the home's space, enabled through Roomba's spatial awareness of the home." iRobot has been partnering with Amazon as well. With all of this potential in the world of smart-home systems, it's easy to forget that iRobot also has a lot of opportunity within the overall vacuum market. It's the undisputed leader in robotic vacuums, with an impressive 62% of global market share, but robotic vacuums make up a small piece of the overall vacuum market. Obviously, a robotic vacuum costs more than many traditional vacuums, but even in the world of high-end vacuums -- those that cost $200 or more -- robotic vacuums occupy a small niche. Specifically, of the $7.5 billion spent on high-end vacuums in 2017, robotic vacuums only accounted for about $1.7 billion (roughly 23%). That market is highly concentrated in the U.S., which is why iRobot is aggressively targeting the European and Japanese markets, with some success. In Q3 2018, revenue grew by 19% in its Europe, Middle East, and Africa region and by 13% in Japan. Of course, that was dwarfed by the 45% revenue growth in the U.S., but it shows that iRobot is making inroads in these crucial global markets. International growth will also help to offset the potential impact of higher U.S. tariffs on vacuum cleaners that went into effect this year. With all of this growth opportunity, it's surprising that iRobot's P/E ratio of 36 is actually lower than Whirlpool's 37. But it is a lot higher than, say, Techtronic's 18.4. Its Enterprise Value to EBITDA ratio of 15.9, on the other hand, is more in line with Whirlpool's 16.6 and Techtronic's 12.9. Both those metrics, though, are lower than they were two years ago, and definitely on the low end of their range over the past two years, thanks in large part to the big market sell-off in October 2018.
iRobot's current business of selling robotic vacuums is strong and growing, and it has propelled the company to the top spot in its industry with no debt on the balance sheet. Not only is the untapped market for robotic vacuums huge, but iRobot is also well-positioned to take advantage of the current trend toward the smart home. For most stocks, a PE ratio of 35 is a rather high valuation. For iRobot, though, this is low compared to the typical premium assigned to this high-growth stock. At its current valuation, iRobot definitely looks like a buy. John Mackey, CEO of Whole Foods Market, an Amazon subsidiary, is a member of The Motley Fool's board of directors. Suzanne Frey, an executive at Alphabet, is a member of The Motley Fool's board of directors. John Bromels owns shares of GOOGL, GOOG, and Amazon. The Motley Fool owns shares of and recommends GOOGL, GOOG, Amazon, and iRobot. The Motley Fool has a disclosure policy.